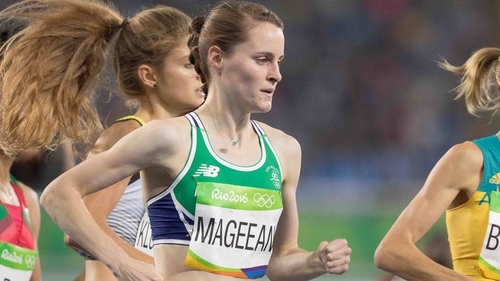 Ciara Mageean won a high-quality women’s 3,000m in 9:08.83 and there were two new Irish records on the first day of an engaging Irish Life Health National Indoor Championships in the Sport Ireland National Indoor Arena. Race-walker Alex Wright (Leevale) broke RobHeffernan’s 5,000m record to win gold in 18:50.70 while Sharlene Mawdsley (Newport) broke the national junior 200m record to win her heat in 23.85. The women’s 3,000m was the highlight race with three Olympians toeing the line and multiple internationals including two-time European Cross Country Champion Fionnuala McCormack (Kilcoole). The Wicklow woman, who ran the Barcelona half marathon last week, led the opening stages of the race with Mageean and Leevale’s Olympic steeplechase Michelle Finn in close pursuit. Around the halfway stage Finn split the pack and only Mageean could hold on to the pace. The UCD woman eased away in the final 400m to win in 9:08.83 to Finn’s 9:12.61 with McCormack third in 9:15.58. “I was happy with that especially with the field,” said Mageean who has had a tough week battling with a head cold and the passing of her granny in Portaferry. Kate Veale (West Waterford) was a popular first winner on the track with the former world youth champion on top of the podium in the women’s 3,000m race walk in 14:03.90 from Emma Prendiville (Farranfore Maine Valley) in 14:06.54 and Maeve Curley (Craughwell) in 14:18.26. “I’m really happy to be back. I’ve a long way to go to get back to my best but I’ve made my first steps,” said Veale afterwards. Alex Wright (above) has been in excellent form this indoor season and made it three wins from three starts. “It’s been a great season so far and I’m racing a 20km in Switzerland next week,” said Wright afterwards. “I’ll look to focus on one event come the world championships in London this summer. Michaela Walsh (Swinford) won the women’s shot put with an indoor personal best of 14.95m and the fifth-year schoolgirl was happy with the win. Mid Sutton’s Sarah McCarthy won the women’s long jump as expected with a best of 6.03m while Sommer Lecky (Finn Valley) continued her fine form with a personal best of 1.81m in the women’s high jump. In the men’s field events Antony Daffurn (St Ronan’s) won the triple jump with a best of 14.83m and pole vaulter Thomas Houlihan (West Waterford) added the national senior title to his university crown with 4.75m. There were a number of exciting heats with Sharlene Mawdsley winning her 200m heat in 23.85 while Phil Healy (Bandon) and Sinead Denny (DSD) qualified comfortably in the women’s 400m. Brian Gregan (Clonliffe Harriers) was impressive in the men’s 400m heats with a time of 47.11 seconds.